There have been so many fantastic places opening in Cambridge recently and we truly are spoilt for choice. When it comes to Japanese food, you can find somewhere on every corner! I often pick up a noodle or rice dish when I'm out and about as they are so much easier then a sit down meal, so all of these new 'food on the go' restaurants are perfect for me. 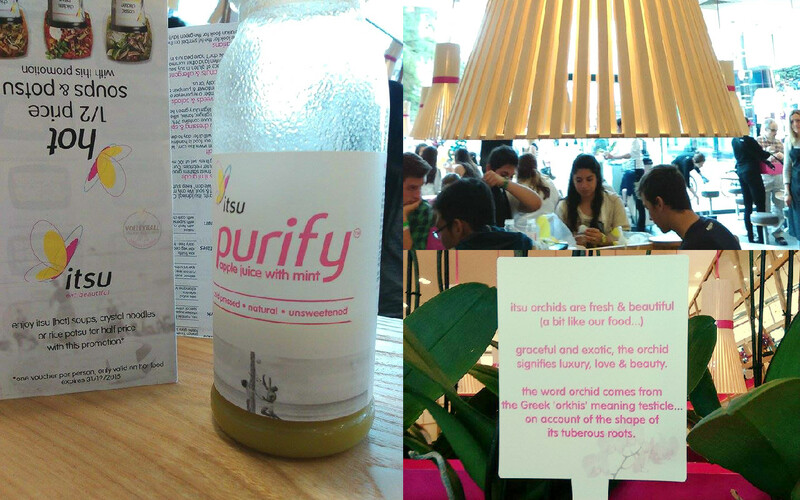 Upon arriving at the new Itsu on Sidney Street I was so pleased to see it so busy and vibrant. There are mirrors everywhere, colours all over the walls and beautiful looking plants in every corner and it makes it feel so inviting. Some very friendly staff invited us all in and asked us if we would like a chicken teriyaki dish or a salmon dish and of course I went for the chicken. Since going travelling I have become a big fan of Asian food and I've got to admit that I am a big fan of chicken teriyaki. I love the freshness of the dish, but also the thick sweet teriyaki sauce that's full of flavour! Within our 'goodie bag' we were also treated to some Metcalfe's popcorn, a yummy juice drink, a menu, chopsticks and a really sweet Cambridge themed present...a bike seat cover. 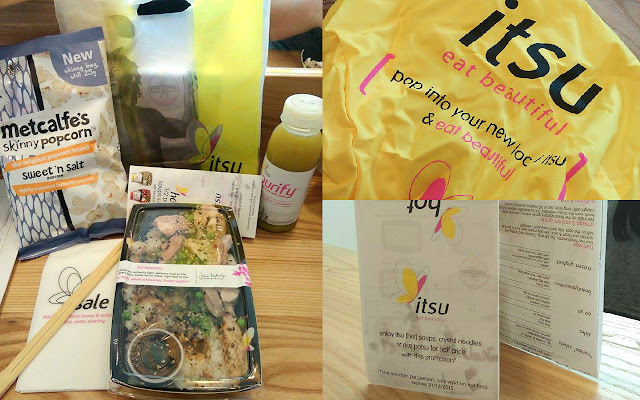 If you're not from Cambridge then you wouldn't know then Cambridge is full of bikes and I feel like Itsu definitely gets some bonus points for providing such a practical gift. Although we didn't have any prices available in our goodie bag, I have seen online that the prices are very reasonable. 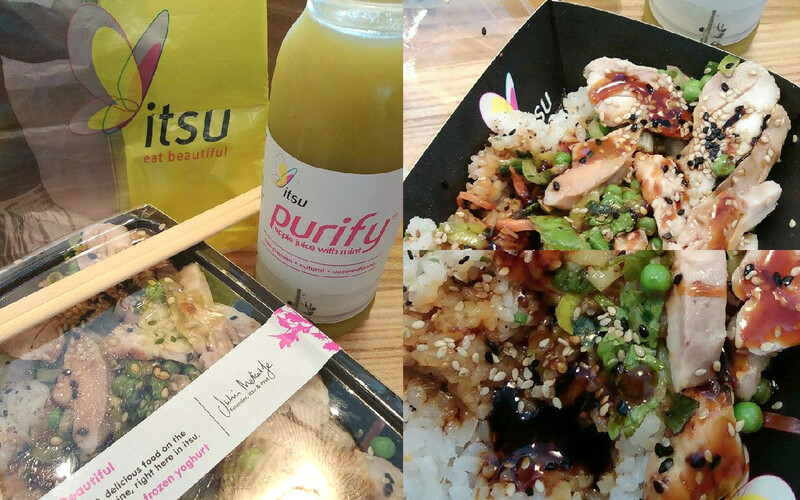 The chicken teriyaki dish is £4.19 and I left feeling very full so it's certainly the perfect meal for lunch. So many people have slated Cambridge recently for it's 'bland' offering and I think they couldn't be more wrong. Every month new and exciting things are happening and Itsu coming to the city is definitely one of those exciting things. I love Cambridge too, its such a vibrant city for food and fashion! I love the ambiance it has, the photographs showcase them perfectly.